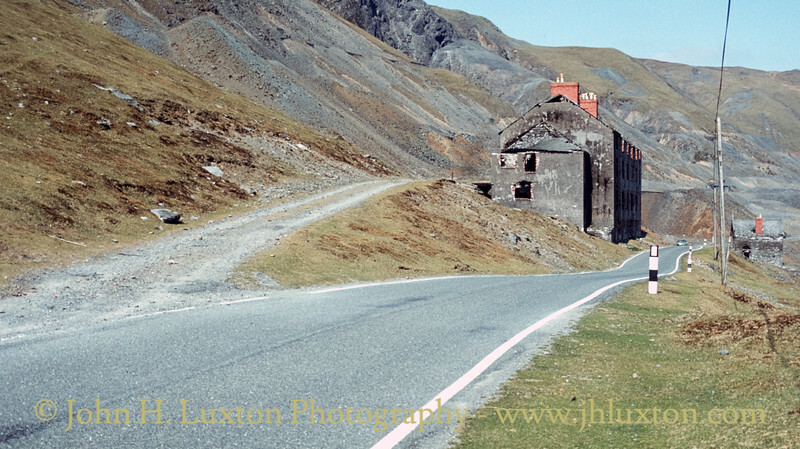 Cwmystwyth Mine is considered to be one of the most important mining sites in Wales. The site has a long history from prehistoric times through to final closure around 1950. 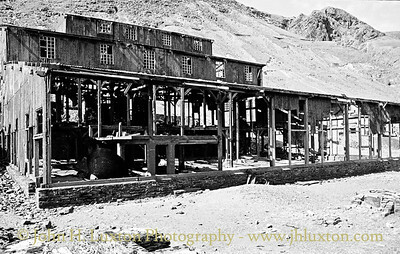 Mining on any scale had ceased in the later 1920s and most of men were paid off around 1930 and only caretakers kept on maintaining machinery and buildings and to deter thefts. Use of the mill probably ceased at this time but had probably only been intermittent through much of the 1920s. 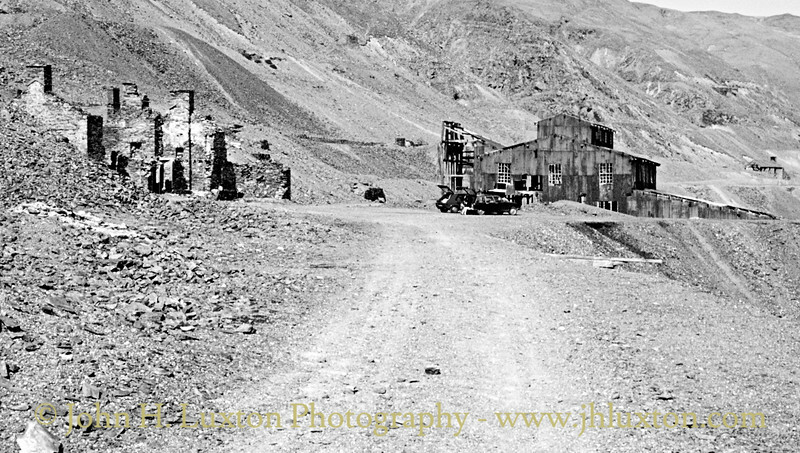 Production during 1930s was spasmodic and small - it seems to have been confined to hand-picking ore off the dumps. Activity ended around the start of World War II. It is believed that the mill machinery was scrapped immediately after the war. 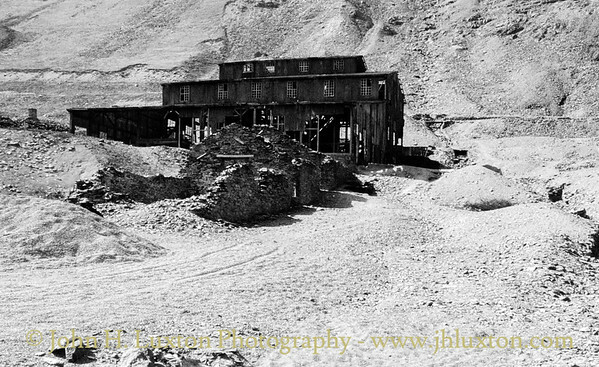 The mine being officially abandoned in 1950 though no real activity had taken place since the start of the war. It seems that the mill machinery was scrapped immediately after the war. 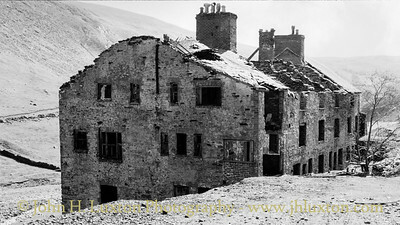 Staff House (the Barracks) was part converted to a house and the remainder simply decayed. The last resident of Staff House moved out around 1950 after which decay speeded up. 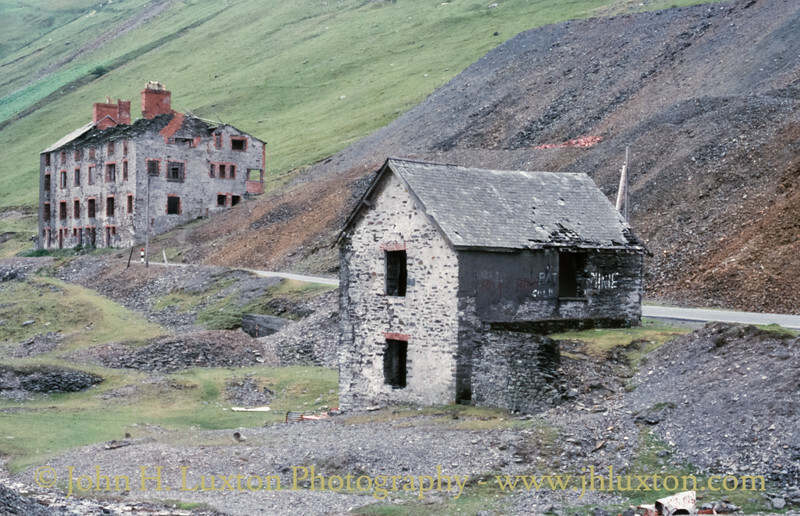 I visited the site in May 1984 and made a second visit in 1986 when the barracks and the main mill building were still standing. Unfortunately, these buildings were demolished a few years later. 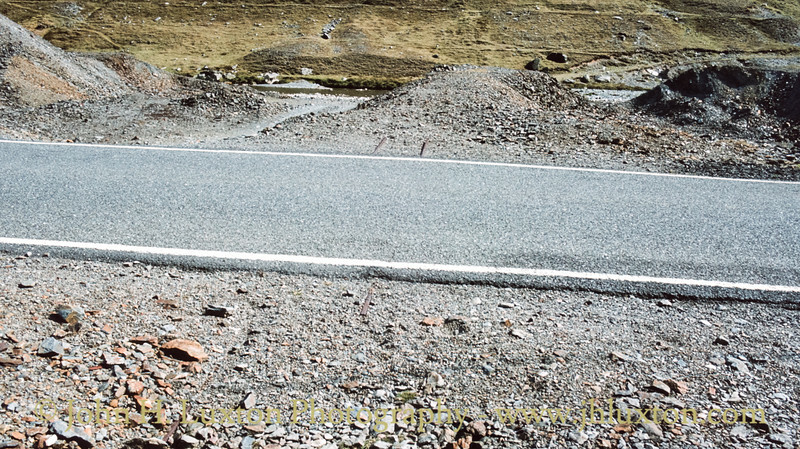 My greatest regret was that I didn't take more photographs! 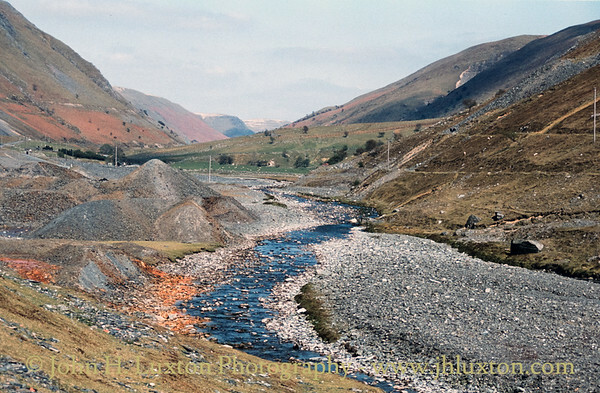 The site is now being conserved by the Cwmystwyth Mines Trust. I am grateful to "Garregfawr" on the Adit Now forum for providing with me with some additional information on this site. 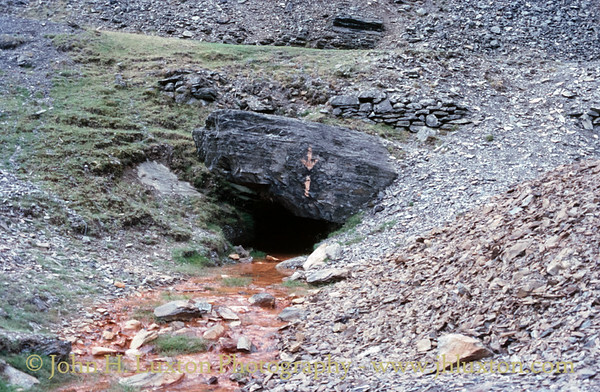 Entrance to Pugh's Level with iron oxide stained water draining from it. View towards the Barracks Building or "Staff House". 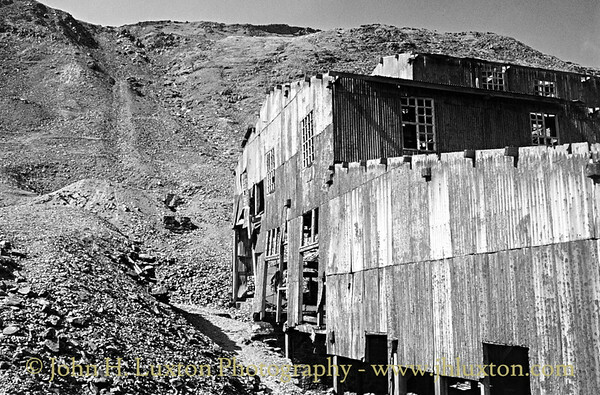 Nearest the camera was built as No.1 Crusher House: there had been a waterwheel to drive the rolls; it was located in a gap between the long side of the building seen in the photo and the retaining wall. The building was converted into the mine caretaker's house around the start of World War I, when it was called Ivy Cottage. The south end of the wheel-pit was demolished, the pit was part infilled and steps built in it. These steps gave access to the basement which during this last period was for a time used as a laundry either by the mining company or as a company-approved venture by the occupants, presumably washing work-clothes over the weekends. (Thanks to "Garregfawr" for additional information on this building. The mine access road and barracks building viewed from the west end of the site looking east. The now demolished barracks buiilding of which only the foundations now remain. 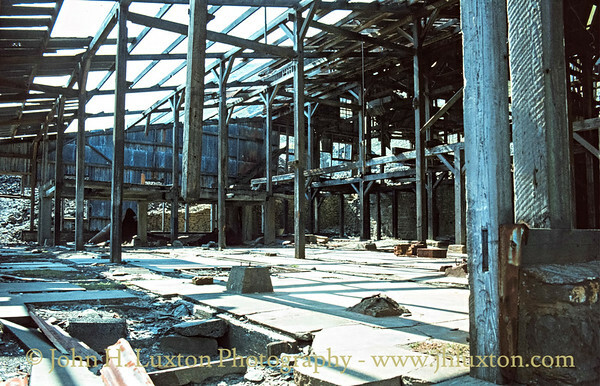 Interior of the mill building, the structure of which was decidedly dodgy and as I didn't have a hard hat back then I decided to remain outside. The scooped out area of the tips are associated with "Lefel y Ffordd" rails from which extended across the road and can be seen in other photographs. View of the corrugated iron mill building. 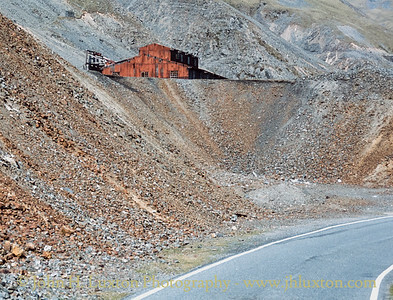 The sheeting had rusted provided a stark contrast against the mainly grey mine waste. The ruins in the foreground, down slope of the mill, had been the concentrate stores. View of the corrugated iron mill building. The sheeting had rusted provided a stark contrast against the mainly grey mine waste. I have also converted each of these images to monochrome. The ruins in the foreground, down slope of the mill, had been the concentrate stores. View of the corrugated iron mill building. 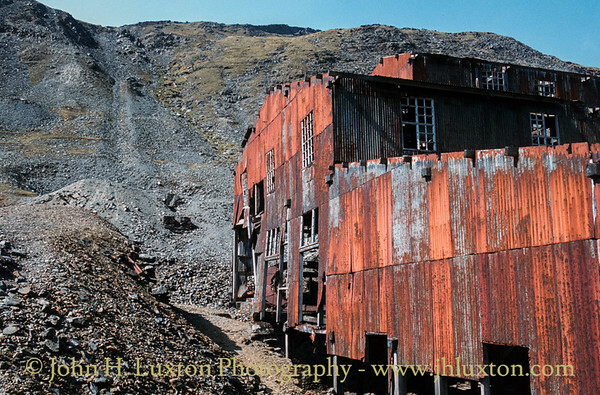 The sheeting had rusted provided a stark contrast against the mainly grey mine waste. 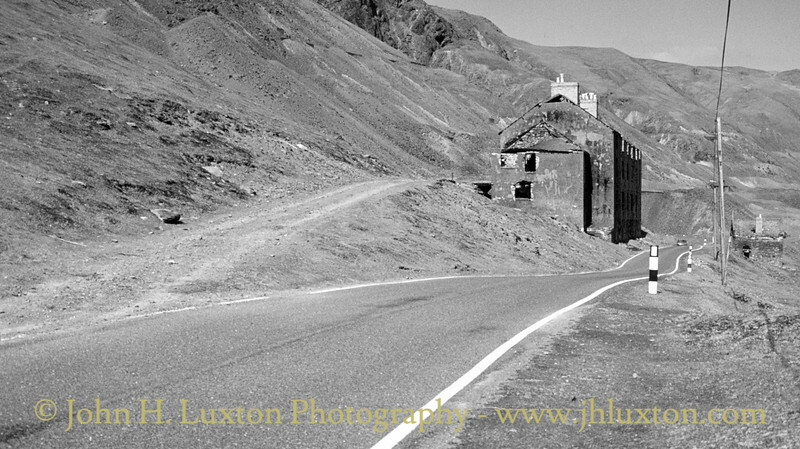 I have also converted each of these images to monochrome.